The 2019-20 Budgetary alocation for the Indian Army’s modernisation programmes through capital acquisition route is pegged at 29,447.28 crore. After meeting committed liabilities of approximately 21,600 crore, this leaves about 7,800 crore for initial payments for new contracts. Of the capital allocation for the Army, 2,115.43 crore is budgeted for Aircraft and Aeroengines, 2,128.05 crore for Heavy and Medium Vehicles and 18,562.15 crore under the ‘Other Equipment’ head. A meatier revenue allocation of 20,337.40 crore has been made for Stores, of which the substantial part is for purchase of ammunition. These figures provide a broad indication of the direction of Army modernisation spending. But it’s clear that budgetary constraints have forced the Army to reprioritise its programmes and optimising its spending to met its most immediate requirements. This has led to the foreclosure of big Army programmes like the Battlefield Management System (BMS) and the stalling of a dedicated Optical Fibre Cable (OFC) secure communication network. The concept of modernising the Infantry too has shrunk from the wholesome Future Infantry Soldier as a System (FINSAS) to acquiring better small arms and personal protection equipment like bullet proof jackets and helmets for soldiers. The big ticket Future Infantry Combat Vehicle Programme (FICV) too is being recast. Ahead of Army Day on January 15, the Indian Army Chief, General Bipin Rawat emphasised that his priority was to modernise the small arms inventory, while ensuring better artillery firepower. Just a month after General Rawat’s public statement, a $91 million contract was signed on February 12 for importing 72,400 Sig Sauer SiG-716 assault rifles from the US under a Fast Track programme. A similar contract is expected soon with Caracal of the UAE for 93,895 carbines. The initial lot of 5,000 sniper guns too has been delivered to the Army’s Northern Command. More elaborate Make in India programmes will be launched soon for acquiring 650,000 assault rifles and 350,000 carbines. Artillery modernisation, which kicked off in 2018 with commencement of induction of the M777 ultra light howitzers (ULH) and K9 Vajra tracked self-propelled howitzers, is on track. 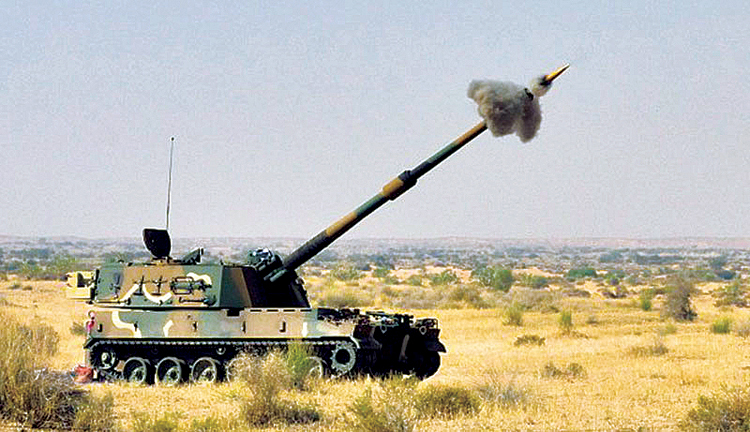 The Army has also placed an indent for acquiring Dhanush artillery guns being developed by the Ordnance Factory Board. It is also expected to commit itself to the ATAGS towed gun being developed by the DRDO. A new Short-Range Surface-to-Air Missile (SRSAM) programme is also close to being signed. This envisages every unit of Army Air Defence to be equipped with the SRSAM. This involves technology collabortation between the Defence Research and Development Organisation (DRDO) and a foreign OEM, and subsequent nomination of a production agency. Besides, the Army will continue to invest in the indigenous Akash air defence batteries. There’s also a long-standing need for a new anti-tank guided missile (ATGM). After a change of mind on acquiring the Israeli Spike, a new decision is expected this year. Another priority is helicopters for Army Aviation. General Rawat expressed optimism on progress in acquiring the American Apache gunship and the indigenous Light Combat Helicopter. “The LCH has done well. It is making good progress. The altitudes at which it has operated gives us confidence. We need to take a call at Aero India next month,” he had said, hinting that a contract for the first lot of the indigenous attack helicopters could be signed at Aero India in February. Hindustan Aeronautics Limited announced recently that the weapons trials on the LCH, including the firing of the Mistral air-to-air missile, are complete. The Army is expected to sign up for an initial lot of five LCH gunships. But the asset which the Army really has set its heart for is the American Apache, which is central to the Army’s aspiration to taking over the attack helicopter role from the Indian Air Force. “We’re confident that the Apache (attack helicopter) will be signed. We’ve tagged our requirement along with the Indian Air Force (IAF)’s. The issue is who will control the attack helicopters. The role and charter for which we’re inducting the Apache needs to be decided,” the Army Chief had said, referring to the Army-IAF turf war over control of the attack helicopter role. The Army has projected an initial requirement for six Apache gunships. The Army continues to acquire the indigenous Advanced Light Helicopter (ALH), and a part of this nfleet is also being weaponised to give it an anti-tank role. “We need better rockets and missiles for the ALH WSI. The DRDO is developing a rocket and missile for this helicopter. If it is able to meet development and production timelines, these weapons will be indigenously acquired. Otherwise, we will go in for imports,” the Army Chief had said. General Rawat had also announced that acquisition of hand-launched UAVs for all Infantry battalions deployed close to unsettled boundaries was another priority. This is being done to avoid sending troops in harm’s way and thereby minimising casualties. Efforts are also afoot to find equipment for detect tunnels being dug along boundaries to abet infiltration of terrorists. “Things have changed. It’s time for a relook. The equipment used by the US Army is not our requirement. We are modifying our requirement,” General Rawat told SP’s Editor-in-Chief Jayant Baranwal, while explaining the reprioritisation of acquisitions.